I’m excited to announce that I’ll be teaching a Thai soup cooking class on Thursday, June 29th from 6:30-8:00 pm at the Mediterranean Living Studio at 150 Pleasant St. (The Paragon Building), Suite 335, in Easthampton, MA. All attendees will get a full bowl to eat at the end! Vegetarian and vegan options are available upon request. The many health benefits of Thai soups including how they can help bolster immune health and calm digestive issues such as heartburn, GERD, IBS, dysbiosis, leaky gut and more. The many health benefits of Thai herbs, including 3 traditional Thai soup ingredients with powerful anti-inflammatory properties that can fight even the toughest gut bacteria. The nourishing and restorative power of REAL broth, and why Thai-style broths are easier to make than western-style broths (hint: no simmering the broth for hours on end!). How to easily find Thai soup ingredients. 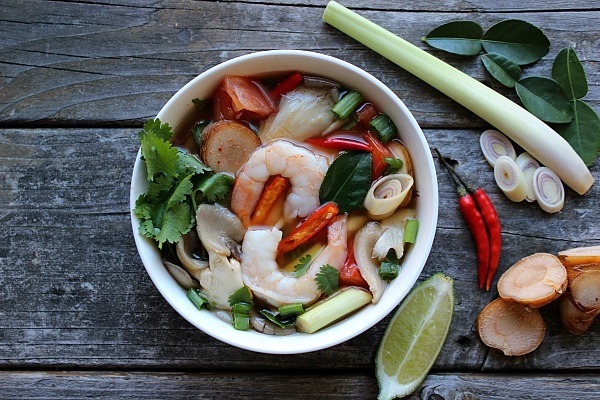 There are no exotic, difficult-to-find ingredients in tom yum goong and they can all be found locally. How to customize Thai soups to your personal tastes. You’ll learn to season your soups to your personal liking, just like they do it in Thailand. For example, if you don’t like spicy, no problem! You’ll learn how to alter each recipe to what you like. I’ll also have copies of my new book, The Thai Soup Secret, for sale, which includes 40 recipes for different types of Thai broths and soups. The cost for the class is $20 per person. Space is limited to 25 people on a first come, first serve basis. Any questions please email me at craig AT pvnutritiontherapy DOT com (looks funny but this helps to prevent spam). Please click the payment button to reserve your seat. I look forward to having you in the class!